Please update your internet browser to see the video. Many advantageous features and a robust modular design allow DyVaR to be used in remote areas as well as in highly advanced treatment centers. Industries where DyVaR is applicable are numerous and include: oil and gas, drinking water, IX regeneration and the treatment of RO rejects. During the International Water Summit 2017 in Abu Dhabi, Salttech has won the innovation prize Innovate@IWS. Below you will find the (Dutch) press release on this joyous occasion. DyVaR units consist of nonmetallic components and are modular. 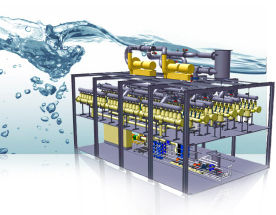 Nearly any capacity or desalination rate is possible with DyVaR. DyVaR systems can treat 50 liters/hour (or 7.5 bbl/day) up to 10's of m3/hr (or 1,000's of bbl/day).